Raymond announce X-Ray 2.0, a program which is frontend for VirusTotal multi scanner. X-Ray will provide users with automatic submission of files that you think are suspicious to 35 (Agnitum, Antiy Labs, Avast, AVG, Avira, Bitdefender, QuickHeal, ClamAV, Comodo, Dr.Web, Emsisoft, ESET, F-Prot, F-Secure, Fortinet, Hacksoft, Ikarus, K7Antivirus, Kaspersky, Kingsoft, McAfee, Microsoft, Norman, nProtect, Panda, PC Tools, Rising, Sophos, SUPERAntiSpyware, Symantec, TotalDefense, TrendMicro, VBA32, Vipre, ViRobot). - Automatic failover when chosen method for sending files to VirusTotal fails. - Copying MD5 hash and results to clipboard via right click context menu. 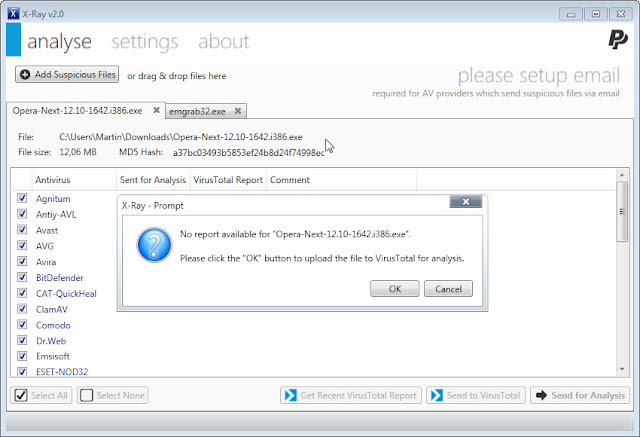 The new version features several improvements, most prominently full support for VirusTotal’s API 2.0, support for automatic captach recognition services, proxy support, and a right-click send to option to use the program from within Windows Explorer.